We tend to keep it simple. 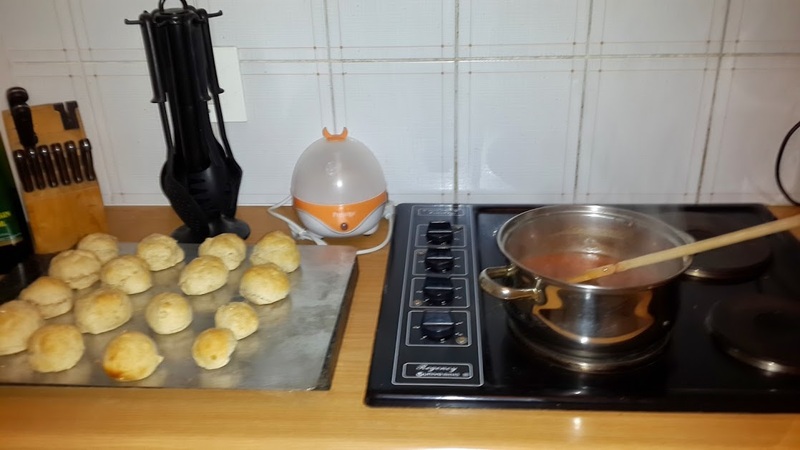 Plain rolls, beef patty, cheese, tomato sauce and mustard. Occasionally we’ll add tomato or fried eggs for a bit of variety. I almost forgot to take pictures because I was starving when we made this batch (and I’m generally pretty terrible at remembering to take pictures anyway) hence the big bites taken out of the one burger. 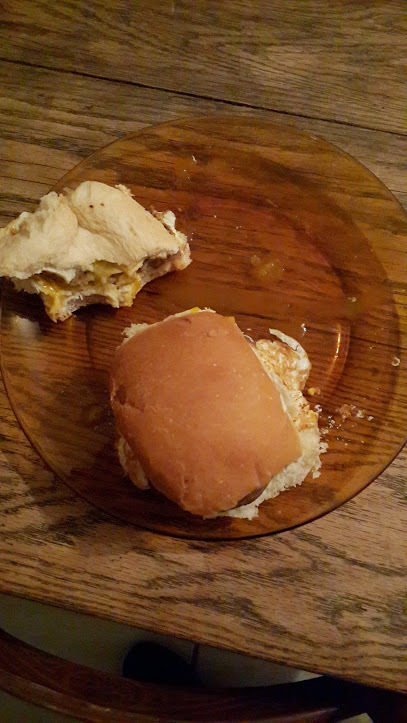 This specific batch had cheese and fried egg on. They were amazing. I highly recommend the beef patties or the chargrill patties from your local Checkers. I really intended to do another post detailing the lovely pea and potato soup I made last week Thursday. I even took photos again and everything. But, both hubby and I proceeded to end up with either a tummy bug or food poisoning, and even thinking about the soup makes me gag (even though it tasted completely fine while we were eating it). So I don’t want to blog it or even look at the photos anymore. 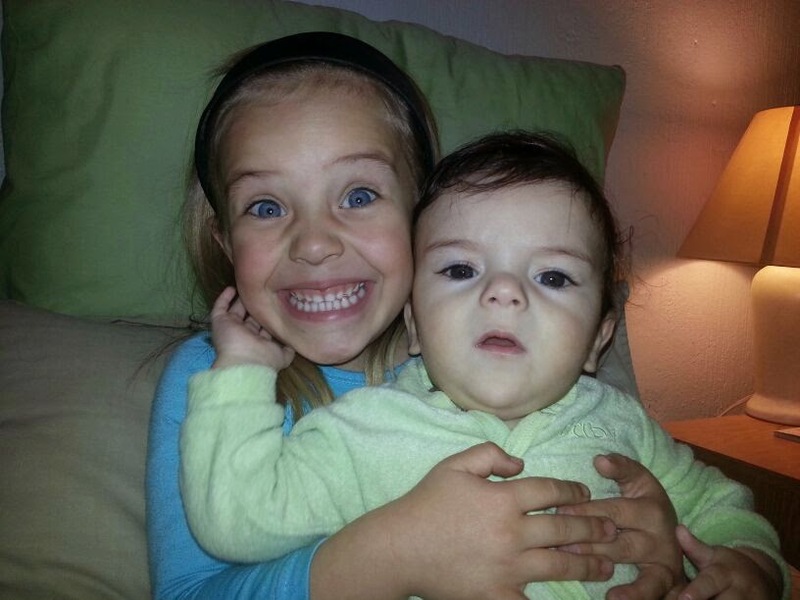 I have a family of four and, up until recently, we were a single-income family. That’s almost unheard of in South Africa, where you have to earn a pretty large salary for the luxury of one parent staying home. I’ve had to find cheap, easy recipes that my husband, young daughter and infant son (who just recently started eating solids – yay!) would all enjoy. Enter the classic and well-known spaghetti bolognaise. A firm favourite all over the world and so quick to make. I breastfeed my son, and he’s allergic to onions so I didn’t use my usual tomato&onion mix. The tin in the pic already had basil and oregano added, which made it even more convenient. 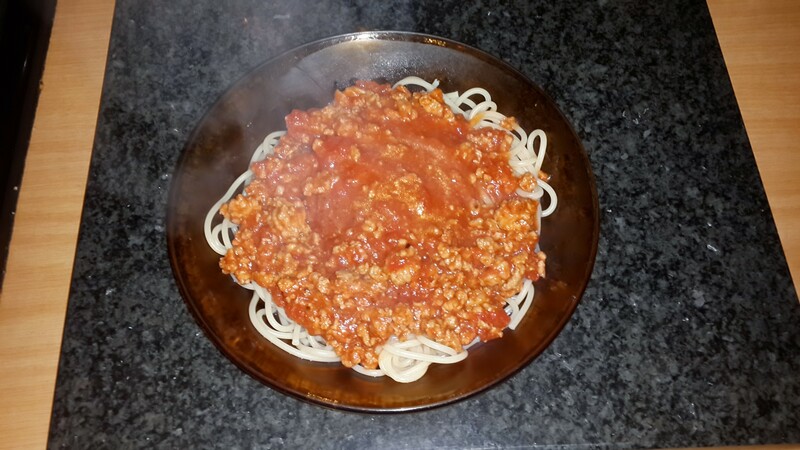 The spaghetti was cooked following the usual package instructions. Seriously, I could cook pasta before I knew how long to boil a soft egg for. It’s super easy and pasta sells for an average of R10 a packet depending on where you buy. 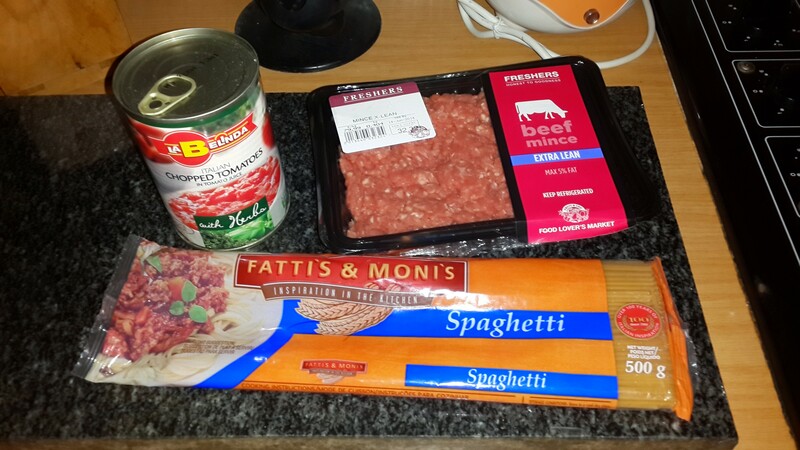 I prefer very lean beef mince, which tends to be slightly more expensive, but I don’t like the fatty kind at all. You can generally get away with around R35 for 400g or so. This is enough to feed us plus a little left over for me for work the next day. I’m not sure exactly how much the tin of diced tomato cost because hubby bought it, but I do know that the average cost for a tin of diced tomatoes with added herbs is between R11 – R16 depending on the brand and where you buy it. I started off by frying up a bit of garlic and adding the mince to brown it. 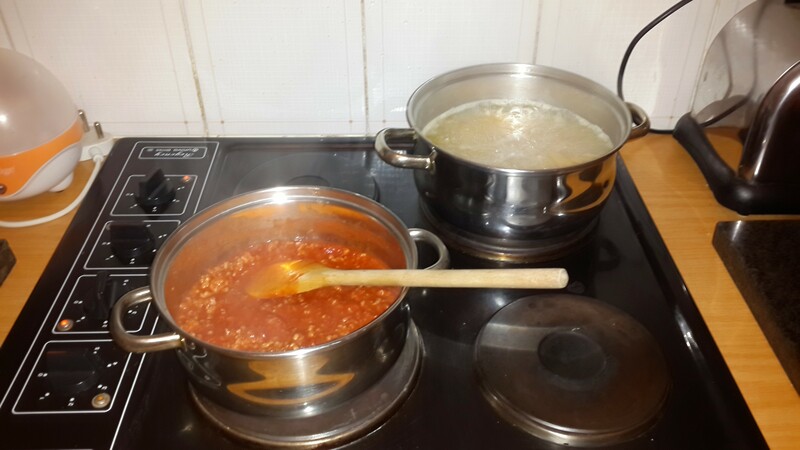 (If you’re adding onions, be sure to sauté them before adding the meat) I then added the tin of diced tomatoes, a sachet of tomato paste and some Ina Paarman’s Rosemary and Olive Seasoning and let it simmer for a while. I also added my secret ingredient….a teaspoon or so of sugar. The sugar really rounds off the flavour and stops it from being too bland. Et voila! Super quick, super easy supper for under R60. This works with almost any kind of meat. I’ve even made it with tuna. It works with no meat at all, but then I would double up on the tomatoes. I used to hate cooking as a child. I stayed as far away from the kitchen as I could, much to my mom’s dismay. The idea of cooking and then cleaning all that mess up was about as appealing as having a root canal with no anaesthetic. The I moved out on my own and suddenly I had my kitchen all to myself. It’s like a switch flipped. I adore cooking now, and find it almost as therapeutic as reading or taking a long, hot shower. I haven’t quite gotten over my aversion to baking though, but I’m taking baby steps. Two weeks ago I tried my hand at a box mix of malva pudding. It came out so beautifully that I tried it from scratch when we had the inlaws over this past weekend. I’ve subsequently asked my mom for the family recipe, because the one I got off the internet was a bit soggy. The jury in still out on whether I like baking or not, but in the meantime I’ll continue experimenting with new stuff in the kitchen. I still have a blog. Amazing. I doubt anyone out there is actually still looking to see if I might post anything. Don’t worry, chances of me becoming a regular blogger again is virtually zero. I’ve just never been that into documenting my life in any way. I get bored too quickly. That probably makes me a bad mommy too, since I don’t catalogue my daughter’s milestones either. Meh, sorry, at least my husband takes a LOT of pictures. Anyway, this blog will stay here. It has it’s uses, and maybe something will change, and I’ll regain my will to blog again.